Create, print, search and E-mail F-Gas certificates. Manage all your assets from one simple platform. Knowing how much gas and of what type is in a bottle is invaluable to any #Air conditioning or #Refrigeration business. 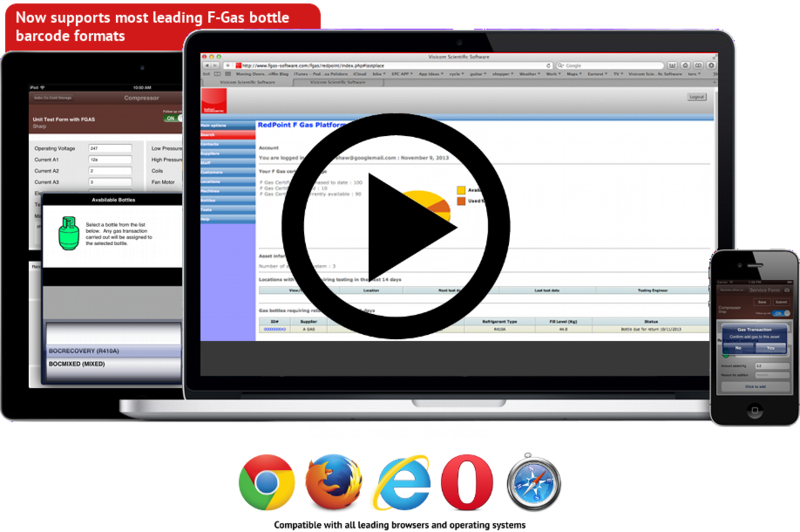 RP F-Gas software has it covered with complete traceability of gas usage and escape, not to mention bottle tracking. Above is a 2D #Datamatrix barcode, and I am betting that in less time than it takes to make a coffee you can have your smartphone or camera phone reading the information it contains and in doing so enter a whole new world of bottle management for #F Gas engineers. Simply open your APPSTORE or GOOGLE APPS on your phone and search QR code reader. Download one of the hundreds of free apps out there and then point your camera at this very screen. Got that…. great! OK that’s how easy it is to let all areas of your business recover information form your bottles. That’s right, no more filling in paperwork when you return mixed recovery bottles, simply scan the code and print the page or even email it direct to the supplier to print .. or get them to scan it at the counter and let them print it! The barcode you have just scanned is printed by RP F-Gas software, which allows you to manage all your bottles and more importantly the gas decanted and recovered to and from your bottles. More information on hand, less error and less theft of gas by employee’s who fancy doing a moonlight job with your van at the weekend. If the bottle is returned empty but RP F-Gas says its still half full, then it isn’t rocket science to know that gas has gone astray. © 2014 Visicom Scientific Software All rights reserved.